Volunteering with Mercury is a great way for you to gain valuable teaching and classroom-based work experience while helping less fortunate children or young adults gain the skills they need to aim for a brighter future. Whether you are on a gap year, career change, or looking for a worthwhile experience during a vacation, you will have an important role to play as a teacher in one of our partner schools. 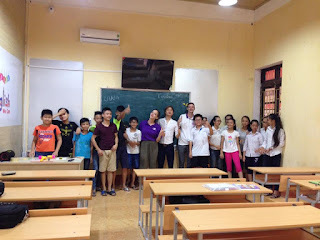 There is an enormous demand for learning English among Vietnam’s youth and it is taught in all secondary schools, many elementary schools, and in certain college departments. Although public schools are generally well-run, class sizes are large and can really benefit from having a teacher coming from abroad as a change from the norm and brighten up the atmosphere of the classroom. Since the mid-1960s Vietnam has followed an American model of education and administration and the country has recognized the rising prominence of English as the language of business and the importance of adapting the education system to the rapid pace of its economy. Tourism is also growing in Vietnam and speaking a high level of English is crucial to getting a good job within the tourism or business sectors. As a teacher in Vietnam, your focus will be on improving your students’ conversational abilities. You can also get involved with teaching extra-curricular activities such as art, drama, and music, depending on your skills and interests. In most schools you will lead your own class, though a few schools will allow you to begin as a classroom assistant to support the local teacher in their lessons. At our schools, students range in age from 5 years old to young adults depending on the department where you are placed. Whether you are teaching your own class or assisting another teacher, a large part of your role is to help improve the students’ English pronunciation. By teaching fun and inclusive lessons, you will develop your students’ confidence and impact their futures. They will be interested in learning about you and your life in your home country and we really hope you will enjoy sharing your experiences them.